Weekend rambles and a Snow Storm is Coming! We started the weekend off with my husband coming home late Thursday night 🙂 For those of you that are newbies to my blog (welcome), my husband works in another Province. So, it means I’m a part-time single parent for anywhere from 3 days to 3 weeks. It’s life…for now. I woke up Saturday morning to multiple message on email, Facebook and twitter. Why, you ask? Well, I won an EPSON PULSENSE from Maritime Race Weekend! Holy Sh*t, seriously! Maritime Race Weekend isn’t until September but they are promoting their event/registration all the time with prizes and swag items. Nice way to start the weekend, eh! 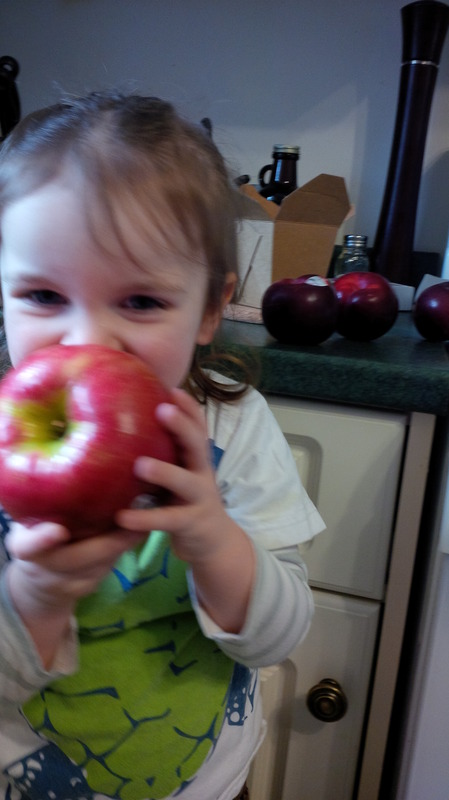 Yummy Honey Crisp Apple the size of my face, Mommy! Saturday we had a relaxing day, hit up the Farmer’s Market and attended a birthday party for one of Hilary’s friends in the afternoon. Sai and I decided to have Thai take out for dinner, so we ate after the girls went to bed. As Sai went off to pick up our food I jumped on the treadmill and got my run on. Well, I walked for my warm up and ran my 2k. It was nice to run but getting hard not to increase my speed or distance. 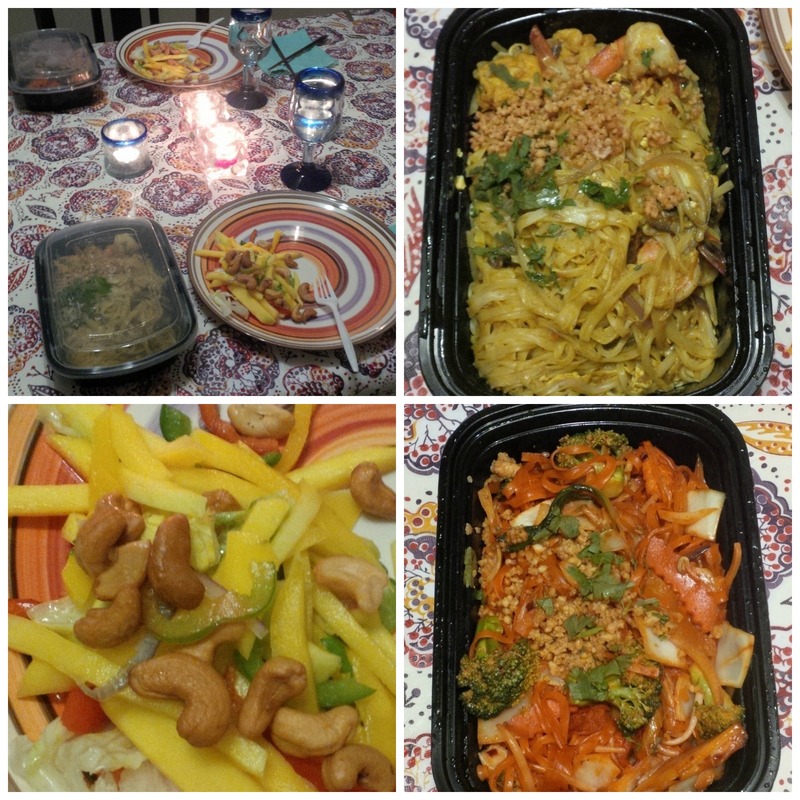 Thai Food – double yum! Sunday I woke up feeling really sick. The head cold had consumed my body so Sai took care of the girls while I slept in. Oh, glorious sleeping in….I forgot how good you are to me! 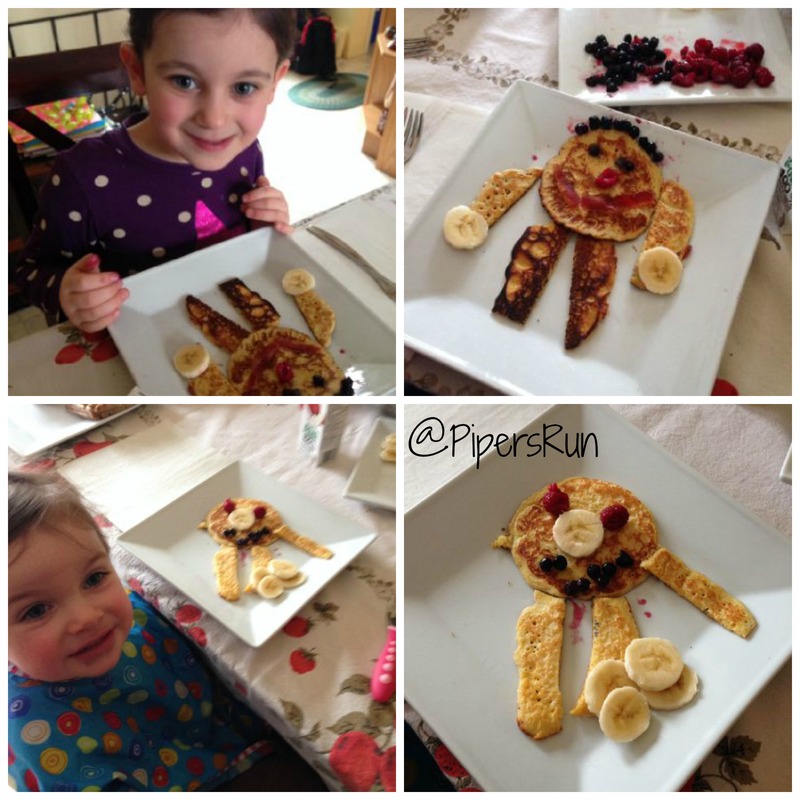 We had brunch with our neighbour where the girls made pancake people! Then we skyped with my husband’s family and went over to our friends house for dinner! Spoiled, we were! Curry and great friends, can’t get much better then that! A pretty fantastic weekend minus the head cold. And…..we are about to get a BIG storm in Nova Scotia (Eastern Canada and US). Get your shovels and snow blowers ready folks! Get up to any adventures or take it easy? I want pancake people! And your daughter with that apple is hilarious! Stay safe and warm! Pancake people looks so fun! What a great idea. You always do the best creative stuff. Hope you are feeling better and good luck with the weather! I’ve never done pancake people, that sounds like fun! Have you seen the youtube videos where someone makes really detailed pancake drawings? Very cool! Stay safe with that snow storm! I’m always hoping we get one here so that maybe work will be canceled, but I work in with a city department and it would basically take the storm of the century for the city to close down. So I will remain anti-snow! Sounds like you had a fun weekend! Glad you and the kids got to spend it with hubby. I need to start hitting up our local farmers market too. My weekend was a mixed bag of emotions, im going to be apart of an iRun magazine column, my back is feeling better. I’m very lucky I wont have to shovel the upcoming mess & hope you’re feeling better! Phew that is all! Enjoy the snow Anna! I’m very jealous. Thanks. I’m not too bad now, morning is the worst. Pancake people were a lot of fun! This might be our new way to eat pancakes! Your Sunday’s sound GREAT!